The Phoenix Pulse Fuel Masters finally experienced defeat in the 2019 Philippine Basketball Association Philippine Cup when they bowed to the Rain or Shine Elasto Painters, 98-94, in overtime, Sunday, October 10 at the Smart-Araneta Coliseum. The Elasto Painters improved to a league-leading 6-win, one loss card as they extended their win streak to four games and sealed a place in the playoffs. Phoenix (5-1) dropped to second. The other teams include Barangay Ginebra San Miguel (3-2), TNT KaTropa (3-3), the San Miguel Beermen (3-3), the NorthPort Batang Pier (2-2), the Alaska Aces and the Meralco Bolts (2-3). Bringing up the rear are the NLEX Road Warriors (2-4), the Columbian Dyip (2-4), the Blackwater Elite (1-5) and the Magnolia Hotshots Pambansang Manok (0-1). Rey Nambatac broke a 92-all deadlock in overtime but it was Mark Borboran, who drove past Calvin Abueva to bank the ball off the glass and into the net, who sealed the victory. Kris Rosales played his best game with Rain or Shine and scored 16 points. Big man Beau Belga added 16 points, nine rebounds, and seven assists. “It was another good win for us. We had a good lead but Phoenix didn’t stop. They came back. That’s probably why they were on top. They never gave up and they fought their hearts out,” said Rain or Shine coach Caloy Garcia. Rain or Shine could have won it outright in regular time but James Yap missed a potential game-winning triple at the end of regulation. Phoenix suffered its first loss in six games. It spoiled Jason Perkins’ career-high 27-points. 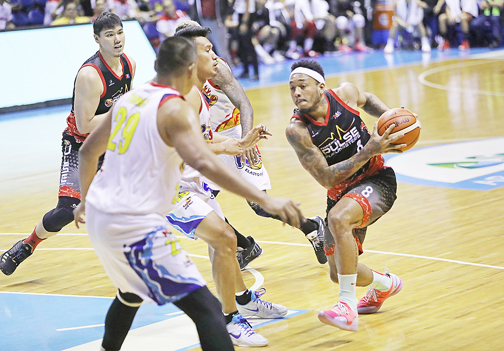 Calvin Abueva added 16 points and 12 rebounds. Matthew Wright also had 16 markers. Rain or Shine detonated a 14-0 bomb to grab a 70-56 lead. It was the biggest lead in the game. Phoenix Pulse came storming back. The Fuel Masters’ rally culminated with a layup by Perkins in the last 13.1 seconds which tied the game at 87-all. Rain or Shine Elasto Painters 98 – Beau Belga 16, Kris Rosales 16, Maverick Ahanmisi 13, Raymond Almazan 12, Rey Nambatac 10, Gabe Norwood 8, Norbert Torres 6, Mark Borboran 5, Dexter Maiquez 4, Ed Daquioag 4, James Yap 2, Javee Mocon 1, Jewel Ponferada 1. Phoenix Pulse 94 - Jason Perkins 27, Calvin Abueva 16, Wright Matthew 16, Alex Mallari 12, RJ Jazul 7, Doug Kramer 6, Jaypee Mendoza 5, Dave Marcelo 3, Jorey Napoles 2, Ron Dennison 0, Justin Chua 0, LA Revilla 0. Quarter scores: 24-20, 45-36, 70-61, 87-87, 98-94.